In this painting by Giovanni Tiepolo (1696-1770), the people of Troy happily tow the gift of the Greeks back to their walled city. Thus the Trojan Horse becomes the agency of their ruin. "Trojan Horse" has become a term of art for devices and strategies of this nature. Operation Trojan Horse was the name given by the ATF to the Branch Davidian project (Treasury Report, Appendix B, pg. B-40). 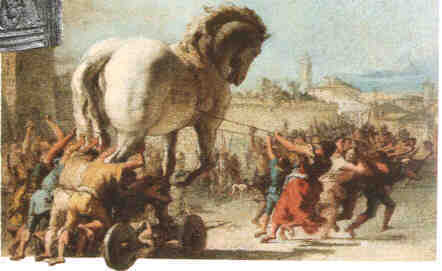 The original Trojan Horse, of course, was the device used by the Greeks to gain access to the city of Troy. The Greeks had besieged Troy for ten years without conquering the walled city. Finally they built a huge, hollow wooden horse, hid soldiers within, and left the wooden horse outside the walls of Troy. The Trojans thought the huge wooden horse was something valuable and towed it into their walled city. That night, the Greeks crawled out of the horse, opened the city gates to the Greek army, raped and slaughtered the Trojans, and burned the city to the ground. "Trojan" was also the name of an operation executed by Israel's intelligence agency, the Mossad. A special communications device, the "Trojan," was planted by Israeli commandos into the upper floor of an apartment building near the headquarters of Moamer Quadhafi. An Israeli ship out at sea then transmitted the messages to the Trojan. In turn, the Trojan re-broadcasted the messages. These messages, prepared by Israeli disinformation specialists, made it appear that a series of terrorist orders were being transmitted to Libyan embassies throughout the world from Quadhafi's headquarters. The Americans were allegedly tricked by the Israeli deception and bombed Quadhafi's headquarters, killing at least 40 civilians, including Quadhafi's adopted baby daughter. The details of this exploit can be found in The Other Side of Deception by Victor Ostrovsky, pg. 143-149. "Trojan Horse," then, refers to any device of treachery whereby the target is destroyed or set up for destruction from the inside by misplaced trust. The presence of undercover agents ("Trojan Horses") posing as Branch Davidians and living inside the Mt. Carmel Center may explain why exact numbers and identities of the Mt. Carmel residents seem dodgy. The Davidians — How Many and Who? Thirty-five allegedly left during the siege and nine officially escaped the fire; a group of 20 also escaped the fire, according to CNN. The FBI figures on those who died in the fire ranged from 95 to 86 in April 1993. By October 1993, when its report was published, the Department of Justice had adjusted its figures to 75 dead in the fire. Davidian survivor Clive Doyle counts 82 dead all told (this number includes two fetuses found in the ruins). He says that six Davidians died on February 28. Excluding the fetuses from the computation, we arrive at a figure of 74 dead in the fire using Clive Doyle's list. Adding the above numbers, the total number of residents of the Mt. Carmel Center might be closer to 130-150 than the 75-100 plus cited in the Treasury Report. Who were these 75 to 150 residents of the Mt. Carmel Center? That is not so easy to ascertain either. One of the first actions of public officials in a hostage or disaster situation is to get a list of the persons affected. Certainly we can expect the FBI had such a list, but the list has been a carefully guarded secret. The reason for the secrecy is possibly that among the Branch Davidians there lived a number of government agents. Some of these people are described in the Treasury Report, pg. 92, "Activity In The Compound." These were "former cult members" who were "in the Compound" at the time of the raid. These apostate Davidians were apparently deployed throughout the building, studying and later reporting on the alleged reactions of the real Branch Davidians to the news of the impeding ATF raid. These people (Trojan Horses?) are not identified by name in the Treasury Report. Nor does the Treasury Report indicate whether those people came out during the siege, or survived the fire and are still posing as Branch Davidians. During the 1994 San Antonio trial of the Branch Davidians, Texas Ranger Capt. Alan Byrnes, who headed the Texas Ranger operation in Waco, alluded to "people inside that were giving some of the information" about the residents of Mt. Carmel Center during the siege, but successfully evaded answering questions about a list of names. He said "we had a rough count of about a hundred people in there, the best we could calculate," but at the same time said the ages and even the genders of the persons inside was in question. (Transcript, pgs. 604, 637-38, 661, 667). Surely this is improbable. There were also, possibly, deep cover professional intelligence agents living in the Mt. Carmel Center. These agents set up a virtual test laboratory of surveillance devices within the Center. 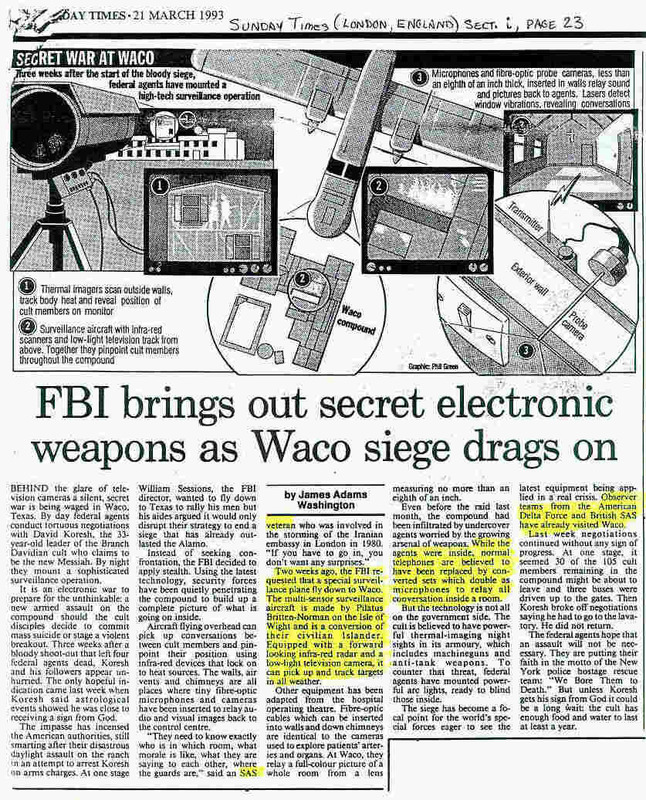 According to The Sunday Times, March 21, 1993, a month before the raid, agents replaced normal telephones with converted sets which doubled as microphones to relay all conversations to government listening posts. Fiber optic microphones and cameras were inserted into walls and air vents. These fiber optic devices relayed audio and visual images back to a control center. Later on, during the siege, thermal imagers scanned outside walls, and tracked body heat to reveal the whereabouts of each of the residents at any given time; lasers were used to detect window vibrations to reveal conversations, and the British Special Air Service flew a multi-sensor surveillance aircraft with forward looking infra-red radar and a low-light television. The equipment on the aircraft could pinpoint the location of anyone throughout the center. The Chicago Tribune of April 21, 1993 reported "Federal sources confirmed Tuesday that the FBI had placed numerous listening devices within the compound and had gotten a good picture of events inside early in the siege." This confirms the information in The Sunday Times (London) article, and suggests deep cover operatives who installed the devices were living among the Davidians. It is possible that the Texas Rangers also had intelligence operatives living in the Mt. Carmel Center. Capt. Alan Byrnes, when asked about lists of persons at the Center during the siege, answered in part: "… I think the information was derived from information that the ATF had, information the FBI had and probably from information that our criminal intelligence people had …" (Transcript, pg. 676). Will the real Branch Davidians please stand? We will have another look at the identities of the Branch Davidians in the Death Gallery in "Who Were Those People Anyway?"